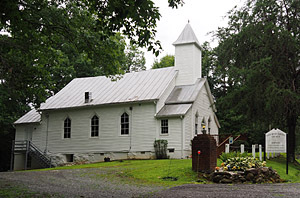 The Esmont area includes ten churches located in Esmont, Porters District, Chestnut Grove, Keene, and Sand Road in Alberene, VA. The majority of these churches were organized in the 18th century: Mt. Zion Methodist Church in Esmont (1828); Sharon Baptist Church in Esmont (1852); Mt. Pleasant Baptist Church in Keene (1867); Oak Ridge Baptist Church in Schuyler (1867); Chestnut Grove Baptist Church (1868); New Hope Baptist Church, Esmont (1875); Mt. Alto Baptist Church, Esmont (1882); Sand Road Baptist Church, Esmont (1883); New Green Mountain Baptist Church, Esmont (1896); and St. Stephens Episcopal Church, Esmont (1914). Izetta P. Smith, who was born in 1899 in Esmont where she attended school and church and grew up in her very large family, wrote a book in 1994 about living in the Esmont community entitled My Life's Experiences. In this book, Rev. Smith wrote about her church life experience in Esmont: "It brings joy to my heart when I think about the yesteryears Easter, the old-time revivals, and meetings with friends which have moved on to the big city long ago. During that time, they came home for Homecoming (Revival) as it is now called. They would stay for a week or longer, and everybody had plenty of company. When they came home, they visited the older people. There were no cars so they walked wherever they went." "So I was baptized in a lake located in an open field and joined New Green Mountain Baptist Church at the age of eleven years. My friend also professed Christ the same day....We looked forward to going to Sunday School and Church. Our Sunday School book was called a Primer in which we learned about the life and works of Christ. There was only one choir in the church, and if the young people showed a desire to sing on the choir, Mrs. Jones, the organist would take them in, and if they sang soprano she would put them with that group, and if they sang alto, they sat together, and, of course, the boys sang bass." Izetta Smith went on to become a Baptist minister, who eventually returned to church life in the Esmont Community." (Source: Smith, Rev. Izetta P., My Life's Experiences, p. 15-20 (Carlton Press, Inc., New York, NY, 1994)). Today in 2018, churches in the Esmont community continue to be a source of joy, friendship, and christianity for their congregations. Comments: Chestnut Grove Baptist Church was formed in 1868 and is considered by many to be the 'mother church' of the Esmont Community. 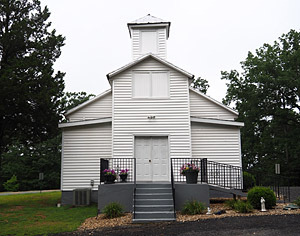 First built as a log church by Pastor Fox and his congregation, its current cornerstone states that this church was rebuilt in 1906 and again in 1965 as it evolved to this large brick structure located at 8825 Chestnut Grove Road in Esmont. A church cemetery extends from a grassy yard into woods behind the church. Comments: Mt. Alto Baptist Church was established in 1882 on a ridge overlooking Mt. Alto Road. Its cornerstone suggests the church underwent expansion or reconstruction in 1956. The Mt. Alto Baptist Church property also contains a cemetery. Comments: Mt. 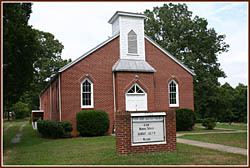 Pleasant Baptist Church was founded in 1867. In the early 1960's, the Mt. Pleasant congregation moved to their church's current location, near the intersection of Esmont Road and Fortune Lane near Keene, VA. Previously, Mt. Pleasant church sat near the end of Fortune Lane in an area marked on some Albemarle maps as "Browntown." Albemarle County's Office of Geographic Data Services labels the former church property as a cemetery lot. No building presently stands there, but rumor has it that the old church steps remain. Comments: Mt. 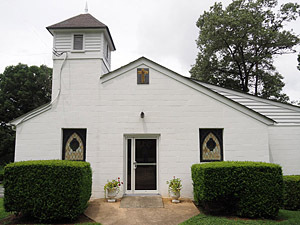 Zion Methodist Church in Esmont began as a log meeting house built by the slaves of Benjamin Childress, a local landowner, in 1828. When it was finished, Mr. Childress donated the house to the Methodist Conference. Later the congregation erected a brick building but because of a defective foundation, the church became unsafe, and the central part of this white frame church above was erected in 1881. To the left of the church building is the church cemetery begun in 1843 with land donated by Mr. Childress. Mt. 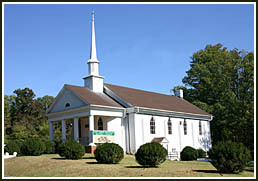 Zion Methodist Church is located at 2620 Mt. Zion Church Road in Esmont. Comments: New Green Mountain Baptist Church was organized in 1896 in Esmont, Virginia, about 7.9 miles northeast of Scottsville, and is located at 7259 Porters Road in Esmont, VA. The congregation was first housed in a small wooden structure heated with wood stoves. In 1946, this building was torn down, and construction on the current cinder block church building began in 1948. This structure, shown at left, was completed by 1950. Various upgrades have been made over the years to include furnace heating, air-conditioning, indoor plumbing, and a finished church basement. March 12, 1875, and located at 7725 Porters Rd in Esmont, Virginia. The congregation's first pastor was Elder Joseph Cary. On the New Hope Church property is its cemetery which contained approximately 153 gravestones in August 2017. New Hope's cemetery borders that of New Green Mountain Baptist Church of Esmont, although that church is now located two miles north from New Hope Baptist Church. Comments: Oak Ridge Baptist Church was founded in 1867, and its current building dates to 1990. 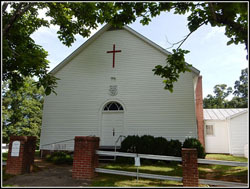 This church lies part way up a steep lane off Irish Road about five miles west of the village of Esmont, VA. Oak Ridge Baptist Church's address is 7734 Old Dominion Road, Schuyler, VA. The church sits right next to an old school building named Oak Ridge School that operated in the early 1900's to late 1930's. Comments: St. Stephen's Episcopal Church was established in 1914 and lies within the village proper of Esmont. 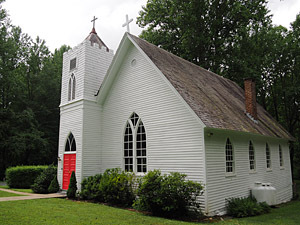 It's address is 7484 Esmont Road, Esmont, VA. St. Stephen's Episcopal Church is part of St. Anne's Parish, which was formed in 1745. Comments: The Sand Road Baptist Church was created for an African American congregation in 1883. 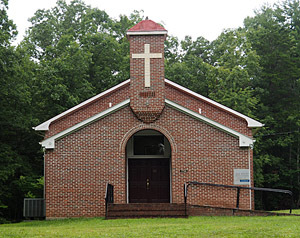 This church is located at 5393 Secretary's Sand Road, Esmont, VA. A small, circa 1930 school house for African Americans, named the Sand Road School, was once housed next to the church at 5407 Secretary's Sand Road. This small school was demolished in the early 2000's. Comments: Sharon Baptist Church was founded in 1852 by William Hunter; Mary Thomas; Ira Wheeler and his son, John Wheeler; John Nichols; and Mrs. John Nichols. 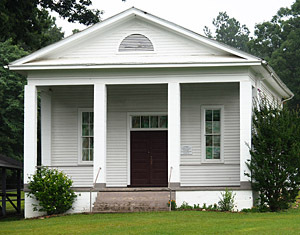 The church was built in a Greek revival style, and a small fenced-in cemetery is located right behind the church building. 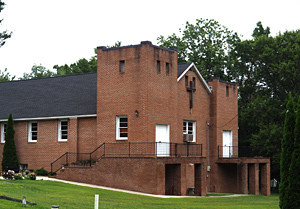 Sharon Baptist Church is located at 8410 Chestnut Grove Road in Esmont, VA.